The Alaskan band has been one of the best live discoveries that I can recall in 2018. Hooray! Portugal. The Man has been a group since 2004, but it’s 2018 that the world has heard about the band. Due to the popularity of their single “Feel It Still”, the Alaskan group has won a Grammy. This allowed to travel and show the world their true value. What was I thinking when I bought the ticket to their concert? I expected a light/pop rock concert. The kind of chill jam, when you don’t think you’ll be blown away by the quality of the group, but might be pleasantly surprised by the pure fun. I have been given a lot more. The concert started on time and I believe that no words can describe my mindfuck here. It’s best you watch the video below to see what kind of “hello” we’ve seen. Beavis and Butthead, the two foul-mouthed nutheads from a famous cartoon, have announced the band in a peculiar way. Portugal, The Man took the stage over and their guitars gently wept the sounds of Metallica. From that moment, the band took its time to make a several-minute-long parallel, in order to finally arch the classic Metallica tune with their own repertoire. This idea has been replicated several times. They took me by surprise in the beginning, but then I was totally digging how easily these moustached men interweaved their jumpy rock with all-time classics. During the whole spectacle, we’ve heard Pink Floyd’s “Another Brick In The Wall” and T-Rex’s “Children Of The Revolution”, whilst the topping on the cake was the chorus of “Hey Jude” in one of the Portugal. The Man’s songs. Out of their own albums, they obviously played a few songs from “Woodstock”. Apart from “Feel It Still” (listen to it below), the band played “Live In The Moment” and “Rich Friends”. One of the best parts was “Holy Roller (Hallelujah)”, which was completely rearranged for the live performance. I also liked the lighter moments – like “Modern Jesus”, right before it went full-rock. What kept me mostly entertained was the serious skill present on the stage. As boldly written on the screen behind the band, “This is all live kids, no computers here”, there was a real rock’n’roll spirit hanging in the air. Portugal. The Man – although their appearance suggests an indie, we-are-quite-sad band – is full of energy. Their guitar solos were seriously good and I’ll say that again – the idea of mixing their songs with rock classics was top-notch. While we’re at the visual setting, the concert was ornamented with the most disturbing, creepy and strange animations we could imagine. 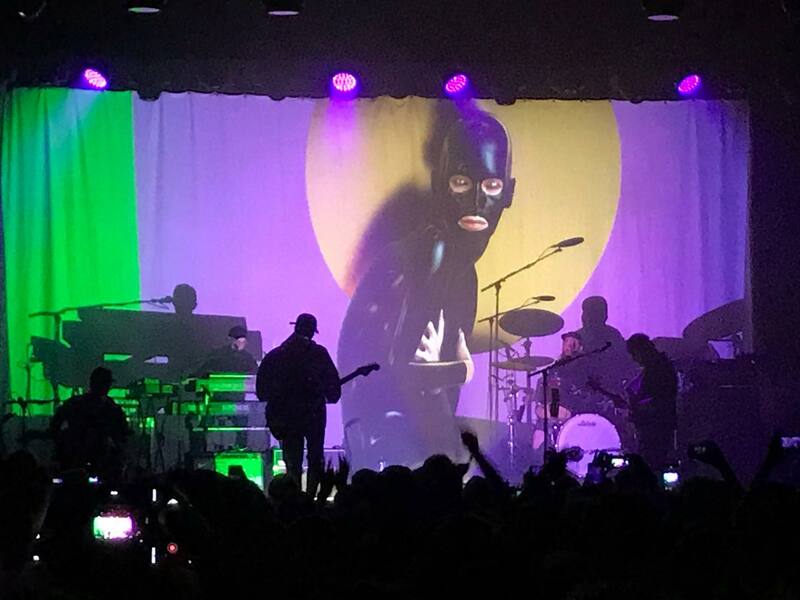 One of the recurring motives was a feminine figure, dressed in a latex costume, who was either staring at the audience or doing rather provocative gestures around her thighs. Either way, the visual part creeped me out. Portugal. The Man was a fantastic experience. They are all fantastic musicians, skilled and passionate. They played a great gig and seemed to enjoy it too. Arguably, their biggest hit was not among the highlights, only proving that for all these years, the Alaskan stars were playing some seriously underrated stuff. And the moment they played a catchy, light tune, they made it to the top. It’s a crazy world we live in.